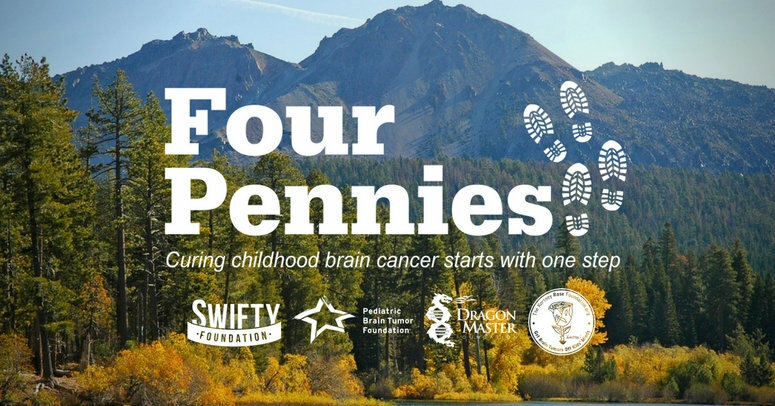 The Pediatric Brain Tumor Foundation has teamed up with Swifty Foundation, Dragon Master Foundation, Kortney Rose Foundation and hiker Eric Montgomery to launch Four Pennies, a collaborative crowdfunding campaign for childhood brain tumor research. Over the next four months, Montgomery will hike the entire Pacific Crest Trail (PCT) with a goal of raising four pennies for each of the 4.6 million steps he’ll take. The $185,000 raised will fund research into diffuse intrinsic pontine glioma (DIPG), a highly aggressive brain cancer that has no cure. Although Montgomery is hiking solo, he won't be alone. The PBTF and Four Pennies’ other nonprofit partners will share updates and crowdfund donations as Montgomery hikes from the Mexican border, across the deserts of Southern California, through the Sierra Nevada and Cascade mountain ranges, before arriving in Manning Park, Canada. You can join the journey by donating via the PBTF’s Four Pennies crowdfunding page and tuning into Montgomery’s videos. Lesson plans are also available for teachers interested in virtually hosting Montgomery in their classroom to discuss the PCT and why he’s taking this trek. All Four Pennies donations will be invested in Project Open DIPG, a collaborative research effort by the Pacific Pediatric Neuro-Oncology Consortium (PNOC) and the Children’s Brain Tumor Tissue Consortium (CBTTC). Project Open DIPG embodies a “team science” strategy – pairing CBTTC’s approach to tissue sample collection, genomic sequencing and data analysis on the CAVATICA platform with PNOC’s clinical trial efforts. Every long and difficult journey starts with one step – whether it’s hiking the PCT or curing DIPG. Take the first step with us by making a donation and following Montgomery’s hike at fourpennies.org. If you're a teacher interested in learning more about virtually hosting Montgomery in your classroom, please email us at info@curethekids.org.